Before I stopped eating meat, turkey was always an afterthought for me on Thanksgiving. It was the gravy and mashed potatoes, the cranberries, the green bean casserole–those were what I really loved to pile on my plate. The turkey was just an obstacle–my mom would make me it eat in order to get to the good stuff. 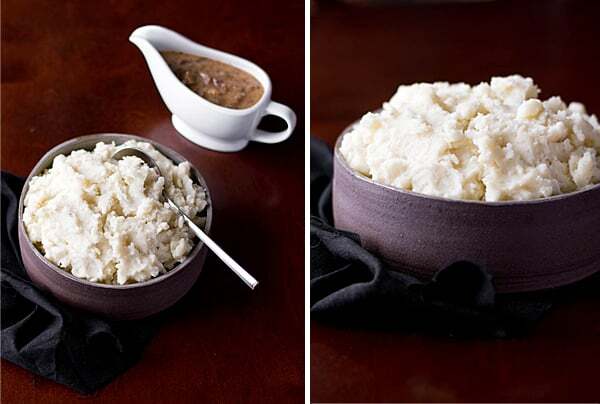 I’d always make sure I had two helpings of mashed potatoes, and then I would pour on the gravy–so much that it would slowly surround my cranberries and seep into my sweet potatoes. But I didn’t care too much, because I loved gravy. Cranberry gravy, sweet potato gravy, it’s all good. Of course, gravy is often overlooked when it comes to accommodating vegetarians on Thanksgiving. 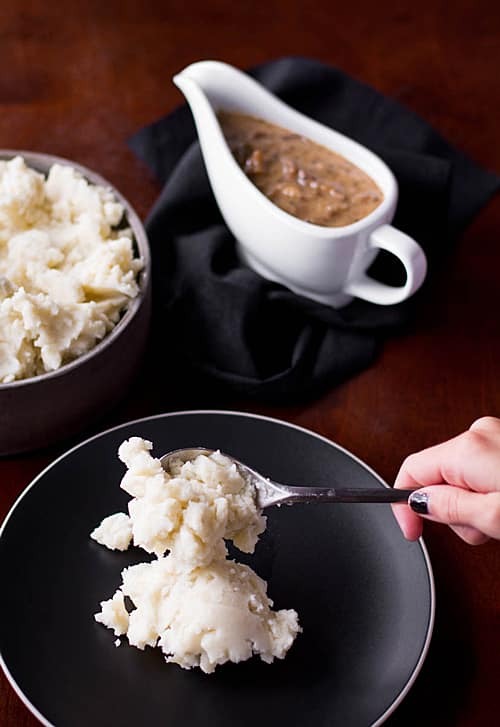 I’m always happy to eat mashed potatoes any way that I can get them, but a little something is missing without being able to drown them in gravy. It’s just not right! So if you’re a vegetarian, maybe you should make some gravy to bring to Thanksgiving this year. I’m just trying to be helpful, you know? Traditional gravy is made with fat and juices from meat, so if you’re a vegetarian, that’s not an option. But mushroom gravy is a good alternative. Mushrooms have that nice umami flavor, making them a good substitute for turkey. I had trouble coming up with a completely original mushroom gravy recipe, so I adapted a recipe from Cooking Light instead. I replaced the button mushrooms with oyster mushrooms, but you can really use just about any kind of mushroom. And while the original recipe called for chicken stock, I replaced that with mushroom stock; if you don’t have mushroom stock on hand, vegetable broth will work just as well. The Thanksgiving recipes continue over on Rikki’s blog! Today she’s posting my French Bread Stuffing. It’s full of delicious things like Swiss chard, caramelized onions, and cheese. Yes, cheese! I love this stuffing and I know you will too. And you don’t want to miss any of Rikki’s beautiful photos! 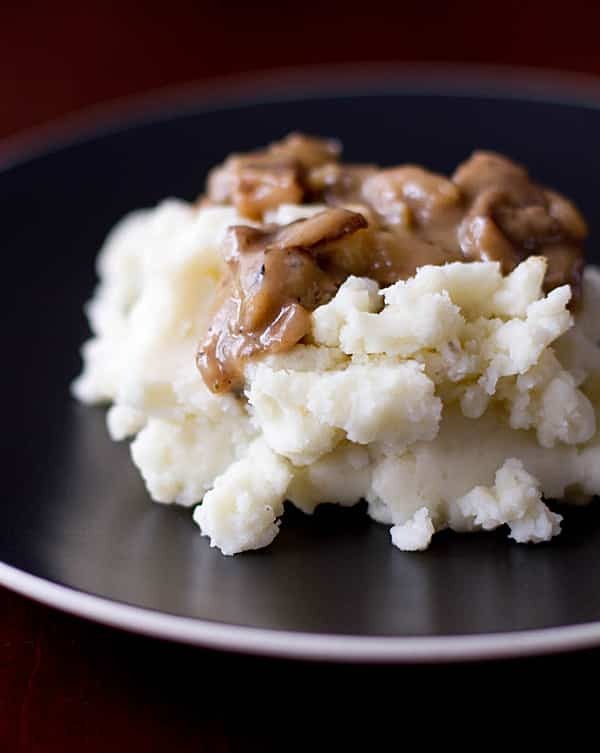 A vegetarian gravy recipe made with wild mushrooms, adapted from Cooking Light’s Mushroom Gravy. Heat oil in skillet over medium-high heat. Add onion and saute 1 minute. Add thyme, salt, and mushrooms and saute about 8 minutes, or until mushrooms are browned. Add sherry and cook until liquid evaporates. Stir in broth. Bring to a boil and cook until gravy is reduced to about 2 cups (about 14 minutes). Whisk together flour and water in a small bowl. Add mixture to skillet; return to boil. Reduce heat to low and simmer until slightly thickened, about 2 minutes. Remove from heat; stir in butter 1 tablespoon at a time and pepper. I’m always the same way! Who cares about the turkey – I want all of the sides the next day. Great recipe that I’m looking forward to trying with my family this holiday. 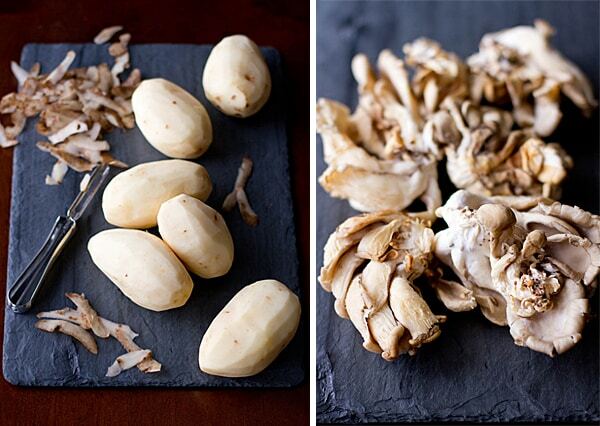 The Umami in mushrooms really does make them a fantastic alternative to meat! I’m going to use this recipe the next time I need gravy. Thanks for sharing! You’re right, gravy does get overlooked! But it’s so important 🙂 I’ll have to try this, it looks great! I will definitely be bringing this to my in-laws for Thanksgiving!! They are a meat-eating family and they tend to forget that I don’t eat meat. They usually put meat in EVERYTHING – beans, dressing, green beans…! I’m so glad I ran across your blog. I’ll definitely become a follower. Ha! I know how that is. And then you end up eating dinner rolls and salad, which is a sad way to spend Thanksgiving! Oh, yum! My mom always made mushroom and white wine gravy and to this day it’s really the only kind I like. I’m an omnivore but will choose vegetarian gravy any day. Hey! Glad I stumbled across this recipe! I’m planning on bringing potatoes and this gravy to Christmas dinner tomorrow. Do you think vegetable stock (not broth) will work? I haven’t tried it myself, but I can’t see why it wouldn’t. You will probably have to adjust the seasonings a bit (add more salt and pepper!) since stock is usually unseasoned. Thank you! 🙂 I’m glad I can help! Yay, I’m so glad to hear it! 😀 Thanks for letting me know! I had this recipe in mind for a number of weeks and this last weekend was perfect for making it. Everything came together! I made it with crimini mushrooms and a mixture of “Better Than Bouillon” mushroom and vegetable broth. It came out very flavorful and tasty! I served it with some red bliss smashed horseradish/garlic potatoes and a salad with a lemon-olive oil dressing. Thank you for this recipe, it really is wonderful! Is there a way to substitute something else for the sherry? I have used red wine too. But if you’re looking for a non-alcoholic substitute, I haven’t tried it myself, so I can’t make any recommendations–sorry! I did a quick Google search and the list of substitutes for the alcohol if that is the issue or the sherry can be found here. I had that question too so I looked it up. what would you recommend for a gluten free alternative to the flour? I’ve never made gravy without flour, but I know some people use arrowroot powder or cornstarch. I love mushrooms!!! Thanks for posting this great recipe. It sounds like the ultimate comfort food especially as summer gives way to Fall and cooler temperatures. Do you think I could make this the night before and heat it up before serving? I’m hosting Thanksgiving so I have A LOT to cook (even with others bringing dishes). Yes, gravy is really great for reheating, although it tends to thicken a lot when refrigerated. I’d keep a little broth on hand just in case it needs to be thinned out, but usually once it’s heated up again, it returns to its regular consistency. What kind of onion do you use for the gravy? Red or white? Can you use different types of mushrooms? I think so! I haven’t tested this particular recipe with other types of mushrooms, but I’ve made similar gravies with cremini, shiitake, and button mushrooms, and they’re always delicious. Oh my goodness this was so incredibly delicious. Served over it over buttermilk biscuits. Just wonderful. Thank you!! !